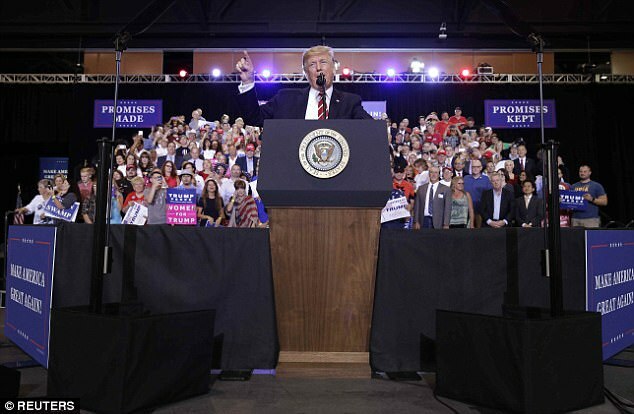 The fake news media like CNN, BBC, France 24, and a whole host of other colluded Establishment news media will state in their news today that Donald Trump is unhinged and that he made a divisive speech in Phoenix, Arizona, but we know that to be untrue. It’ll just be yet more biased “fake news” reporting from the sore loser set of left-wing-democrat-satanic-socialism and their brainwashing tactics that they always use. So as always, we do the right thing and give you the “real news”, and, guess what? People love it! So, without further ado, let’s get into the marvellous speeches given by the White House Administration and special guests who spoke real truths to the American people. As expected, there was a handful of paid protestors funded by you know who gathered outside in their delusions of grandeur, awaiting their $15 an hour pay cheques from said mystery man, but those guys aren’t important to the story. None of this matters, as the people of real America, the people who voted for Trump, are much smarter than fake news, as are we. We wonder when the Establishment’s fake news will ever stop? When will they give up, and when will everybody have enough of them to the point where the people will rise up and publicly expose all the lies of the left even more so than ever, and their ghastly news networks for their brainwashing of deluded people? Yes, their Orwellian and Totalitarian tactics are much likened to the real Nazis, (who were the New Socialist Party in Germany), ties in well with the socialism of Democrats and them actually being the real party of the south. After all, many Democrats have been seen embracing real KKK members as their idols. Facts! Democrats were the slave owners, and Republicans freed the slaves. That’s real American history right there. Anyways, enough of the history lesson, let’s have some pure and honest speeches now. Speeches that the Democrats and the Fake News media like to try to call out as being “unstable” and “unhinged” as they continue to lose their footing, mind you. The ongoing victory of Trump definitely makes us laugh out loud with great pleasure everyday. Let’s begin with delivering yet more “righteousness” in the face of “evil”, shall we? We’ll be starting with VP Mike Pence, and go in no chronological order as they all spread an agenda of love, peace and unity in their own way. Something that Democrats and Socialists cannot even begin to fathom and or even spell correctly… Take it away Mike. Next up, let’s give a round of applause for Dr. Ben Carson’s speech, coming up. We love you Ben. She spread the love there to everyone attending, because she knows, (like any smart person), that there is no racism from the current White House Administration, and the “racism” that you hear about on the “fake news” networks is just a divisive construct carried out by the Establishment, because they’re seriously sore losers after Donald Trump won the Presidency. Thank the lord for that! Now it’s time for Donald J. Trump to take centre stage and deliver yet another amazing speech to reach the nation. We have it all here for you in full, so that you can watch it and dispel the “fake news” media thoughts cluttering up your mind. You can get the “real news” from us, and directly from the 45th President of The United States of America, Donald J. Trump. Sit back and relax, you may learn something from all this. If you’re not already on the Trump train that is. If not, now it’s high time to climb aboard. So there you have it! You can now officially dismiss all the “fake news” stories that only serve to say that Donald J. Trump is unstable and unhinged. To all that garbage, we’d just like to say, “what a bunch of pathetic lies!”. Keep up the good work President Trump! You have fans not only in America, but across the whole free world, where common sense and the awareness of good people support you through everything that you do for the good of the American people, and for the good of the people of the whole wide world. Oh yeah, and nice work for calling out the domestic terrorist group “Antifa” as well. Donald Trump also condemned these groups along with others that were active in Charlottesville, but let’s be honest, Antifa needs to wiped out and right away, along with all other hate groups. When will George Soros be called out for funding domestic terror groups? The liberal left are truly crumbling with the fake news media, along with their devious ways. As the old saying goes, “the good will always prevail over evil”.